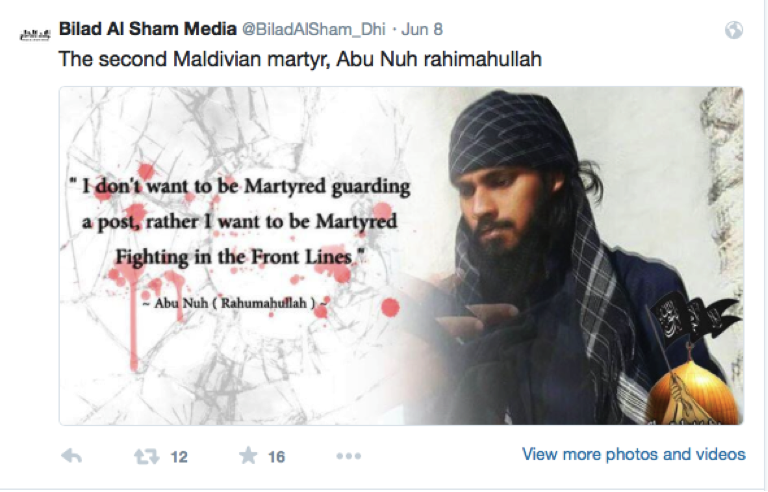 Here is my answer to the alleged ‘Maldivian fighters in Syria’. You takaatakaas invaded our land, assaulted our elected officials, and handed over our country to the kaaminees in your blind lust for power, hoping that the Maumoon gang would give you an enclave to engage in your depraved, ‘cultural habits’. Instead, after Yaagundaa used you to kill our people, to silence those who spoke the honest truth, he had you cast aside, like a used tissue paper. Some of you have escaped to Syria. Other are still busy licking the boots of the Yaameen regime in exchange for clemency. You are not mujahideen – you are traitors who have the blood of our countrymen on your hands. Desperate to escape the inevitable retribution, you have fled like cowards to attack a defenseless people, driving them from their homes as you sought to do so here in Maldives. Bereft of the power they promised you, now again you seek to spread your vile, imperialist rule unto us by force. We know that once Yaameen is toppled by a popular revolutionary movement, your kind will return to prop him to power, backed by saudi military forces. We are expecting you, cowardly filth. Come, and burn in the fire of war. Burn with your backward culture that is the only one in the world that buried female infants alive to ‘save money and family honor’. I will recite here the history of the “takaatakaa” movement so that all may bear witness to their evil. In 2004, when the People began their struggle to free themselves from the imperialist Maumoon tyranny, those salafs and takaatakaas were there, labeling us ‘soldiers of foreigners’ and ‘kaafaru influenced people’. When the tsunami came, the takaatakaas blamed the newly formed MDP for the catastrophe. We were not deterred – 4 years of conflict later, Maumoon was unable to stop the tide of dissent, so abandoning the takaatakaas to their fate, he quickly agreed to elections – the same elections and democracy that he had his paid mullas haraunge and call ‘another religion’. So fell the takaatakaas’ state sponsor, and without top-level government support, their criminal activities were exposed as people began to investigate their crimes. From child brides, to heroin distribution – to indentured servitude and forced prostitution – the so-called religious mullahs were quickly being exposed as frauds, thieves, liars and criminals. So, they attempted to influence Nasheed to legalize child abuse and hush up the continued abuse of the so-called clergy of the takaatakaas. Nasheed, being a Man of the People, refused and had one of their corrupt judges investigated by the MNDF. The army, discovering just how deep the criminal network was, had him arrested pending further investigation. Nasheed had wisely chosen not to whitewash the takaatakaas – a crime that they would never forgive him for. Without the sale of human flesh, without the sale of hard narcotics, the caliphate of sin was on the edge of collapse – and Maumoon knew that a proper investigation into the judges’ activities would expose him as one of the collaborators with the criminals. So came the coup. The takaatakaas called Nasheed laadheenee, and even ‘leader of the kaafaru’ and they invaded our land with a contingent of traitor police and army. They looted our nation, and when Yaagundaa decided that their usefulness was at an end as he got cosy with the Chinese, the takaatakaas fled to Syria – knowing that they had been used by Maumoon, rejected by Nasheed, and again used by Yaagundaa. So they hate us as well, because we dared to reject their colonialist policies. We dared to speak out against Saudi imperialism. We dared to live as humans when all they wanted for us was to be slaves to fight their dirty wars and proxy conflicts. We relish their hate, and return it ten thousand-fold. Can the arrogant thug with the machine gun shoot when his lungs are frothing and melting? Can that gun fire when its components start to melt? Maumoon GE munjey foakey nukiyaa, Anni GE foakey kiyaabala….. Golhaa kamunugosgen varah ragalhu vaane kamah vote lee rundi eh thi Anni thee , NAGOOBALHU verikan libuneema hedhevi faraai handhaan nethi amayey kiyamun dhuvee….yahoodhee aalaathun beynun vaa gothakah vaahaka badal kuree …. When ever he goes abroad he talks against Islam n the prophet Mohamed (PBUH) dhen kon Maumoon eh waheed eh yaagundaa kiyaakah …. Your god is money, your clergy is crime. Your Maumoon is not a god. Your false religion that glorifies wicked politicians and sinful mullahs. Your mullas are not prophets. We will not bow to your false idols and your false hadith and your backward culture that once buried baby girls alive. Whenever Nasheed goes abroad, he speaks against your wicked clergy. It is the truth, that is why you filth are afraid. Your Maumoon also pretended to be a god. And yet he was cast down. You thought you could spread your false religion and sell us to the slavery under the saudis. Wrong. These islands will be your caliphate’s grave.